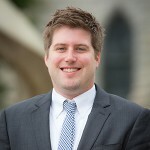 Lucas Novotny, director of Housing and Auxiliary Services, recently received the Ignatian Medal for Outstanding Service to JASPA at the annual conference held at St. Joseph’s University. The award is conferred on individuals who have truly distinguished themselves by the breadth and depth of service they have given to the association or the significant influence they have had on JASPA’s direction, programs, and services. Established the spring of 1997, this award is given annually to a professional staff member who embodies the above commitment to service to JASPA. Lucas served as the vice president for technology and communications for JASPA. In his role, Lucas was responsible for all technology and communication functions of the organization, including website, social media, communication, OrgSync administration, and brand management. Please join the Division of Student Life in congratulating Lucas on this achievement.